The RockJam 54-Key Portable Electronic Keyboard is a great keyboard for young children or anyone who is just getting started with the piano, making it easy and fun to play and learn the piano. It's got some great features for a keyboard of this size and price range. 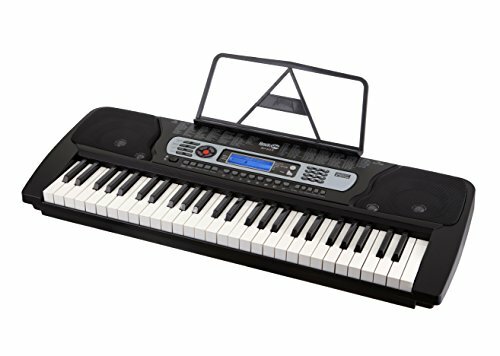 With the RockJam 54-Key Portable Electronic Keyboard, anyone can learn to play the piano, no matter their age or their skill level. It's designed to make your first piano keyboard fun, interesting, interactive, simple, and engaging, to gain your interest and keep you coming back and building your skills over time. The RockJam 54-Key Portable Electronic Keyboard is designed for even small children, to make a fun game out of learning to play the piano. However, the full-sized keys, variety of available sounds, and strong features make it a great choice for even adult beginners to learn on, with plenty of options to continue to learn, grow, and explore the world of keyboards. The RockJam 54-Key Portable Electronic Keyboard is designed for children of all ages to start learning to play the piano in a fun and easy way. Using the companion iOS app or the LCD screen, beginners can learn to play along with a variety of songs, from the classics to contemporary hits, with fun, simple, interactive learning modules that grow with you. As your piano skills advance, you can still get hours of enjoyment experimenting with the robust library of included sounds and rhythms, so you can grow beyond the lessons and into making your own unique music. The ability to play along with drum beats and record your own compositions makes this a great keyboard to learn and grow on. The low price of this keyboard makes it a great choice for parents who want to expand their child's interest in music. 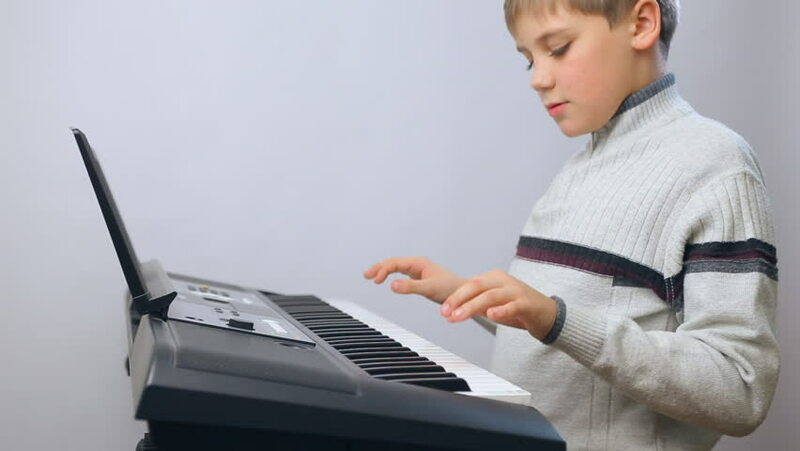 With the RockJam 54-Key Portable Electronic Keyboard, you can easily foster a love of music and learning, but not invest too much in a keyboard that a child might quickly lose interest in. The RockJa​m 54-Key Portable Electronic Keyboard comes with a music rest perfect for either sheet music or a mobile device to help play along. It has stand attachments, audio outputs, built-in speakers, and a library of sound effects and rhythms. The RockJam 54-Key Portable Electronic Keyboard has a lot of features that make it fun and easy to learn to play the piano. The sound on this keyboard is better than you might expect for a beginner’s keyboard at this price range. You can choose a variety of piano, organ, horn, string, and synth sounds, and enjoy good volume, authenticity, and range. The 54 keys on this keyboard are full-size, making them a good beginner tool to practice on. They are not weighted, but have a good feel and can help bridge the gap to a weighted keyboard or acoustic piano. The ability to plug it into a wall, or power it with batteries, makes it easy to use indoors or out, at home or at school. The versatile design allows you to attach it to a keyboard stand and connect external speakers, so it can even be used in a performance. The ability to record and play back your songs lets you learn and grow. 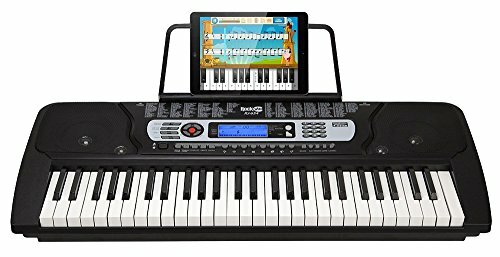 The RockJam 54-Key Portable Electronic Keyboard comes with 30 free songs, and the app provides a fun, interactive way to continue to learn and grow. You can customize your practice options and personalize your learning experience. As you progress, you unlock more songs and advance in difficulty, and the ability to “peek” ahead to new songs keeps students engaged and enthusiastic about learning. JoyTunes continually expands their music library, providing ongoing engagement in the joy of learning the piano. It also has sustain and vibrato keys, to add another dimension to the sounds available from this keyboard, and further stimulate growth and learning. 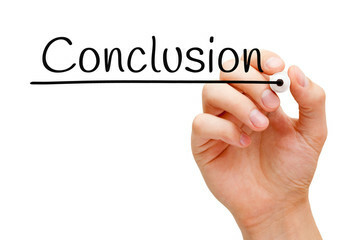 The LCD screen is well-lit and easy to read, in an attractive blue color. It is compact and portable, and weighs just over 8 pounds. And yet it has a sturdy construction able to stand up to hours of use or rough handling by a child. 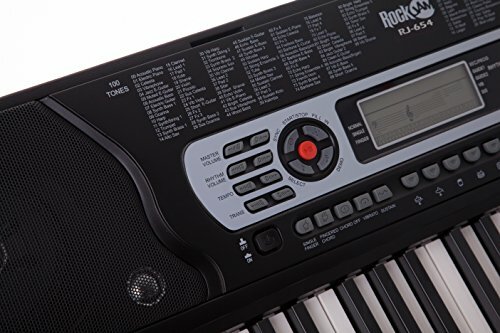 The Rockjam 54-key keyboard has a variety of built-in learning modes. The well-lit, easy-to-read LCD screen shows which chords to play as you practice with the built-in song library and gives good feedback as you practice. The Piano Maestro app is a top-ranked, top-rated education app, helping students learn to play piano and to read music, while practicing rhythm and technique. Free songs range from pop and rock hits like Billy Joel's Piano Man, Pharrell Williams' Happy, Taylor Swift's Love Story, and Rihanna's Diamonds. Classic compositions include Pachelbel's Canon, Mendelssohn's Wedding March, Handel's Hallelujah, and Bach's Minuet in G Minor. You also get songs from popular children's music, movies, and games, including the Tetris Theme, Old McDonald, and Spanish Lullaby. With the ability to assign challenges, get progress reports, and track homework, the Piano Maestro app is also a great companion for teachers to use with students, easily integrating with traditional sheet music and a variety of teaching methods. Interactive, blue-backlit LCD screen is easy to follow and read for lessons and for accessing piano functions. The biggest downside to the RockJam 54-Key Portable Electronic Keyboard is that you have to plug headphones in to a jack designed for external speakers. This means that using headphones does not silence the speakers, so sound is always projected from the built-in speakers as well as the headphones, increasing the chance that your piano practice will disturb others. An alternative keyboard designed for students that doesn't have this drawback is the Hamzer 61-key digital piano keyboard. Like the RockJam, it has a music stand, LCD screen, has record and playback functions, integrated learning options, is lightweight, and has full size-keys. Because of the app and more streamlined operation, the RockJam would probably be a better choice for a younger child. The greater range of features and options in the Hamzer make it potentially a better choice for learners of all ages. 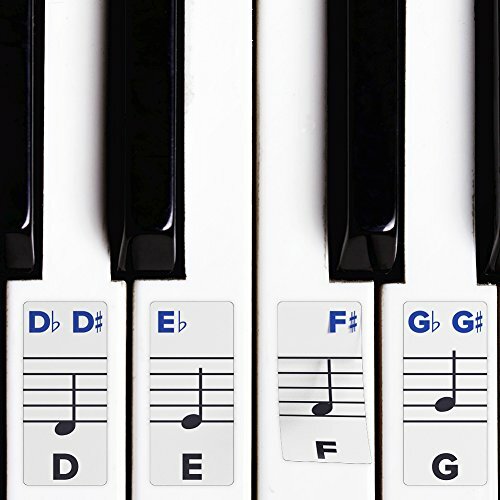 In the early stages of learning, it can be very helpful to use key stickers to identify notes and chords, and help students learn by touch, sight, and sound. Piano stickers make learning the piano more simple and accessible. Piano stickers should be durable to withstand continual touching, but should also remove cleanly once the student has advanced and doesn't need them anymore. 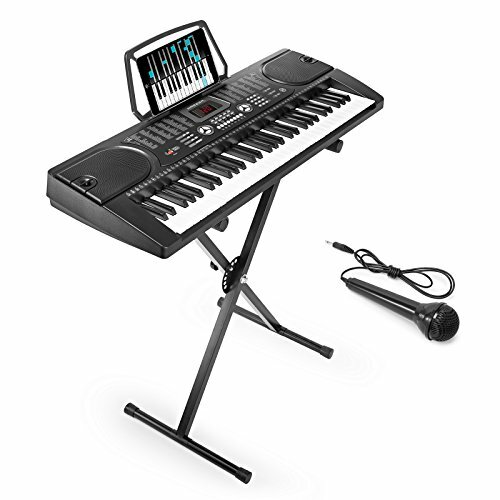 While the RockJam 54-Key Portable Electronic Keyboard can easily be played sitting on a table or desk, the experience will be more authentic and the sound better if it is played on a keyboard stand. 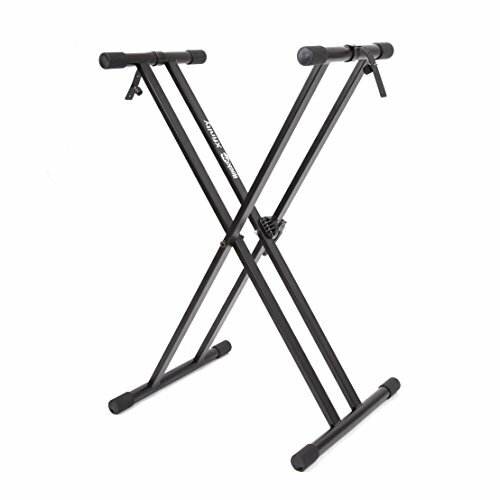 The RockJam Xfinity Heavy-Duty Double X keyboard stand is pre-assembled and easily adjustable, and a great companion to the keyboard itself. The built-in locking straps hold the keyboard securely in place, with rubber end caps for extra stability. 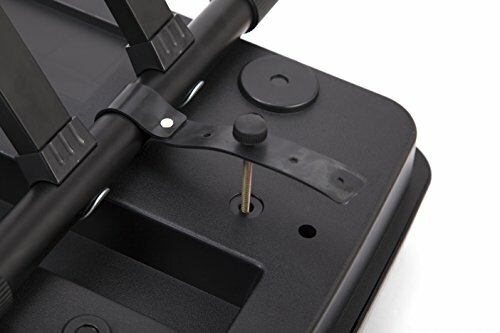 It adjusts easily from 4-38 inches in height, for users of all sizes and ages, and quick adjustment over time as a child grows, with no screws to lose. It can also be quickly folded back into a compact, streamlined shape for storage. Like a keyboard stand, a keyboard bench isn't necessary, but is helpful for learners to get used to the body mechanics and simulate the experience of playing a piano in a performance setting. 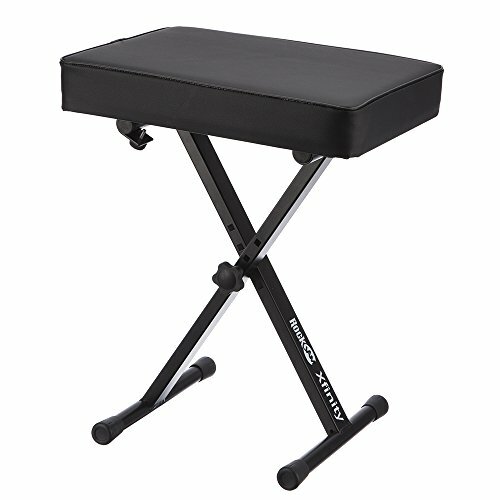 The RockJam Keyboard Bench is made of heavy-duty steel, so it can support players of all sizes. Non-slip rubber end caps provide stability, and the large foam seat provides hours of comfort during performance or practice. It can also be easily folded away for storage in between uses. The RockJam 54-Key Portable Electronic Keyboard is primarily intended for parents who want their child to learn piano, or who have a child that has shown musical aptitude. The natural integration with the app “gamifies” music education, to keep kids coming back to the keyboard again and again, meaning that you no longer have to force your kids to practice their music lessons. Their skills grow naturally over time, with increasing complexity and engagement as they play along with the songs they love. It's also a fantastic choice for music teachers, who can help their students learn and grow, while getting progress reports and assigning customized practice and homework tailored to their skill level. The affordable price means that it's less of an investment if a child loses interest or neglects their practice, making it easy to encourage a child's love of music. 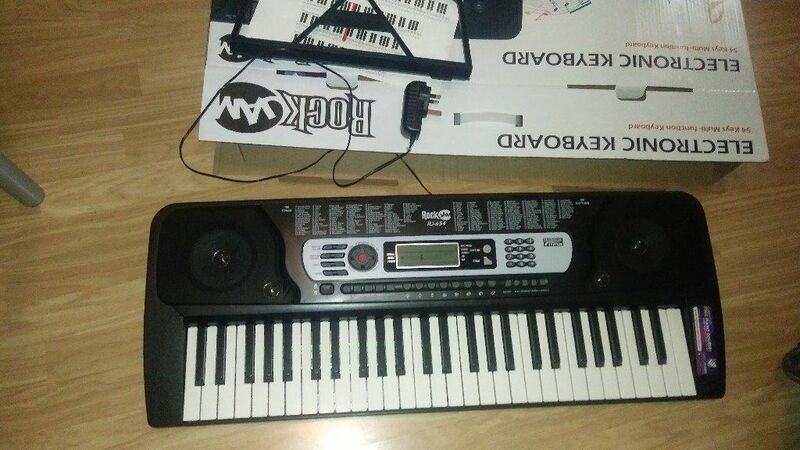 However, it's also a great keyboard for anyone who wants to learn the piano and learn to read music. It makes learning simple, approachable, and fun, with a range of choices and options that will suit adult students as well. Many people aspire to learn to play the piano, but never found the time or couldn't afford the instrument. With the RockJam 54-Key Portable Electronic Keyboard, there is a simple solution to both of those problems, making a love of music and of the piano accessible, fun, and engaging for everyone.